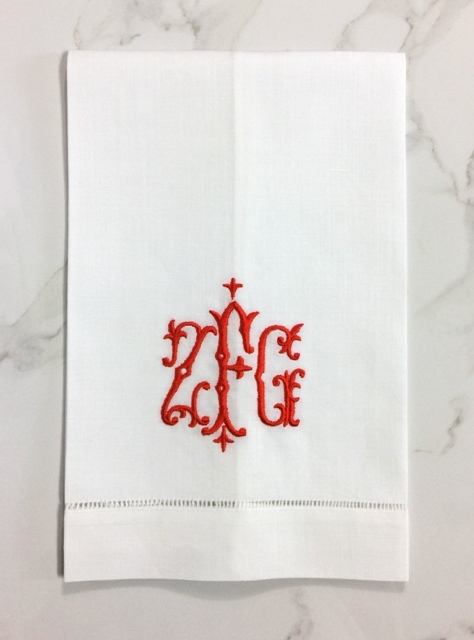 Beautiful 3 letter monogrammed hemstitch linen guest towel. Center letter is accented with an embroidered Fleur D'Lys. TGuest towel measures 14" x 22". Guest towel pairs & sets arrive in our Signature Gift Box with ribbon. Be Sure To Check Your Monogram & Embroidery Lettering Carefully. The best coordinate thread color is used to coordinate to the color of the border selected.